Are you like me? You have a long list of quilting and sewing projects you are excited to begin. Maybe you’ve purchased the fabric and plan to spend all day Saturday on your project. Then, life gets in the way, the project gets shoved into a closet, and there it sits forgotten and unfinished. I’m here to tell you that there is a better way. I know because I am finishing more projects than ever using The Quilter’s Planner. My dear friend, Stephanie Palmer, created this masterpiece of organization. Within the planner are monthly and weekly pages to keep up with your life. But the real bonanza is all of the tools that will aid you in keeping up with your quilting. Simple things like Project at a Glance, Fabric Breakdown, and Cutting Estimator provide answers to quilting questions. I really could go on and on about this stellar product. Instead, I’m going to let Stephanie tell why this planner is so amazing! My favorite thing about have a Quilter’s Planner is the ability to keep a record of what I’m quilting and what I want to quilt. All sketches and thoughts have dates. More than anything else, it’s a record of my creative process. Of course, having this great magazine full of quilt patterns and other ideas makes it totally worth the price. 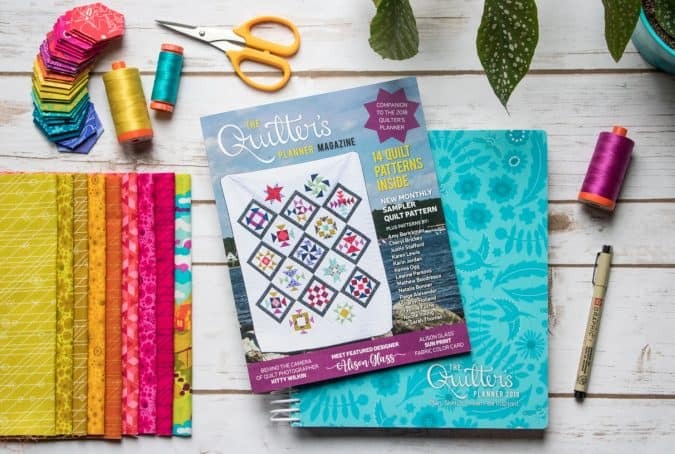 Click here to get your Quilter’s Planner before they are all gone! This planner looks awesome. I would love to get one, but it will definitely have to be a gift. Lol. Keeping my fingers crossed! This planner does look like it would keep me more organized and I really would like to keep a record of what I made as everything is given away. Hope to win one of these! this planner will help me keep track of the things I have plans on making… I have so many things in mind but haven’t written them down to be accountable for them. I think this would help that. I feel certain it would advance my skills as well as keeping me on task. This planner would help me be more organized and have a clearer idea of the direction I want my sewing and quilting to go. Thank you for the opportunity! I sure do need this planner to get my quilt projects organized! I have several projects I need to start but I am so busy that it’s hard to get started on them! I am a 911 Dispatcher and work some different days with different days off. I need to be able to just jump right in there and start my project! I find it hard staying on task if I don’t write down my thoughts and daily plans. Maybe it’s adult ADD. The daily portion of the planner will help keep me on task. Wow, this sounds amazing!! I so need help in organizing my projects. What a great planning tool! Thank you! With this planner I have a chance to finally get a handle on my untouched quilting projects! Would love this opportunity! Thanks for the chance to win. I have been following you for quite a while. Thank you for all the great ideas. How awesome is that! I really need organization in my life and would love to be the winner of this. Wow, I’d love use this planner to organize my quilting. having all the information and ideas in one place would help me to get my projects done instead of holding all that info in my head and would probably help me remember what I have and what I need to complete each project. I would love one of these. I am a nurse at a nursing home and I also have my 86 year old Mom living with me that has dementia , so I need to write down my stuff till I can squeeze in time to do it. Would love a planner to keep me on task! What an awesome planner! I definitely need one of these! Organization is not my strong suit!! This would be the cat’s meow because I am notorious for purchasing a fabric with a great project in mind, usually one I’ve seen on one of these sewing websites and put it in the to do pile, and a few months later, I have no recollection of what I was going to do with it and if I AM lucky enough to remember the project idea, I cannot reember the link to the project or whose site it was oTHISn. UGH. I NEED THIS PLANNER! That looks really nice! I currently have quilting plans on scrap paper all over the place! This planner looks amazing. As a SAHM I often don’t leave time for myself to be creative or work on my projects. I love having a planner to plan out my day and week, but having one that would incorporate my quilting and other sewing projects too would be so great! I love this blog. It gives me so many great ideas! If the planner really helped me get organized, it would be great to have!! This would help me to keep my projects organized. Thanks for the opportunity to win! I love this it would help me so much to keep on task with all my Sewing projects. I already use simple notebooks for keeping track of cutting and tips to myself for future projects but this planner would be invaluable! Fantastic planner!!! I need all the help I can get. This looks like a great tool, that would help me get more quilts done! I need this planner. I buy fabrics with a projetx in mind and add to the stash, and two weeks later, I cannot remember what I bought it for nor what website I found it on. That organization is just the tool I need! Thank you for the opportunity to win one! A planner might be the trick…I print off so many patterns/ideas then promptly forget about them…. I would love to get more organized at home with my quilting projects, as a beginner, I sometimes get lost. Would love to have this planner! I need all the help I can get! Oh my, maybe I’d get something done, or even better completed. Instead of going into the room looking at everything that needs to be done and then walking away because I feel so overwhelmed. This would be great, maybe ‘d get something accomplished. Right now I walk into the room, look around at all I need to do and then walk away because I am so overwhelmed. Thank you for doing this giveaway! I live with post-its, slips of paper, and notes scribbled on my longarm table. I can’t think but that this would help me. I’m a new quilter and have set aside every second Tuesday to go quilting with an elderly woman in my community. I bring my own supplies, and a shared lunch and we quilt for about 4 hours of the afternoon. She’s in her 80s, has been quilting for over 40 years (practically my entire life) and loves the company. I get to make a project under the watchful, if sometimes forgetful, eyes of an experienced quilter. It’s almost like the old days when women joined the neighborhood quilting bee! Only there’s just two of us… 😉 For those who want to quilt more, grab a granny and set up something similar – you’ll both get so much from it! I’m not sure if she’d find this planner useful, but I know I would. I’ve got so much to learn and having this planner and asking her for help with the quilting planning side of it would give her even more pleasure. It’s a beautiful thing you’re doing here. Thanks for a chance to wn. Thank you foe the chance to win this awesome planner! This planner would help me stay on task! Ive never used one and I think this is just what I need! I always have difficulty combining my have-to chores with my quilting! This sounds like it would help with that, plus present a visual of the quilting I am currently doing combined with what I am dreaming. My goal is to get my UFOs finished this year. This planner would definitely be a big help! Thanks! Love this, Huns could really help me. I would love to win this planner! That looks like a book that will be well used. Anything to help me get better organized and focused would be fantastic. I could use some organizing. Looks like it could be “fun” to help keep track of my stitching. I think this might help me to remember my UFOs without having to clean out the sewing closet and rediscover them! I would love to be more organized with my quilting and sewing projects. I know that this beautiful planner would help. It will help me stay on track with holiday and birthday projects. I love giving away my handmade projects to family and friends. I have been wanting one of these planners for quite some time and now that Alison Glass has a hand in it, I want it more than ever! Even the cover is inspiring! Used one this year. Very inspirational! Good format. Organization is as important as is perfect piecing to build a beautiful project. Great idea to make a complete organizer and would be grand to win. I would love the planner to help keep solve my many I-bought-the-fabric-where’s-the-pattern? problems. I am so ready to get more organized!! What a blessing this planner would be! Thank you for the giveaway! I need all the help I can get. I always have great ideas, but get lost int he detail. 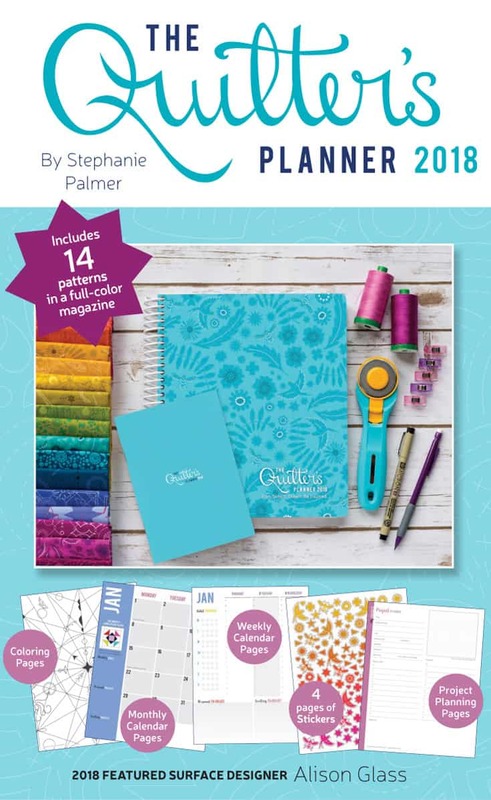 2018 Quilter Planner looks fantastic. Would love to have it to get more sewing and quilting organized. Thank you for the opportunity in this giveaway. I’ve been wanting to get one of these planners. It would help me be more organized and efficient. I’d love to have one place to keep track of projects as well as accessing tips and tricks. I try to keep notes now but end up going back to the internet to look things up again and again because I can’t find where I’ve kept the notes. Thanks for the chance to win! I so need help staying organized and this would do it! Thank You for the chance! This planner looks fantastic and would help keep me organized. My friend had one last year and she loved it. That would be a wonderful tool to keep my life organized! I use a paper calendar now, and one that included a quilter’s organizer would be great for keeping track of everything! I love the idea of planning my quilting time while also using a beautiful planner. Organize me………..get rid of all my notes everywhere! I would love this planter to help me stay organized! I’ve got the projects piled up! I think this would help me get them done! I have used the planner since it first came out, and I love it. I am a NEW quilter. I am a long time seamstress, making clothing and home furnishings, but I am finding quilting to be quite difficult! I think my biggest problem is keeping it all organized. Looking through this planner I think it would be very helpful. I would love this planner to help me move forward on my projects! Hi! I’m a single mother, full time (50+) hours of work a week and I’m obsessed with quilting and try to squeeze it in every second I can. I wake up extra early just to get some time in front of my machine or hand quilting my current hand project. I hope for rainy weather on the weekends so I can stay in and quilt all day and do all the projects I have swimming in my head. This planner would help me so much in organizing my projects and all the ideas I have circling around in my brain. I would love this planner. Thank you. Loving this site, glad to have found it. Being able to lay everything out that I have to do and then getting to see the space I have left to work on my projects will be sew motivating! 😉 There is always a lot to do so I think this would be a great way to be able to visualize my time to sew because I know it’s hiding in plain sight. I’ve really been interested in giving this a try – anything to get more organized! The planner would help keep my projects front and center. Too often I get ideas and sometimes get the fabric and then life happens and it doesn’t get done, another project and another ufo. I would love to have this planner! I taught my self how to sew a couple of years ago but im finding being a full time pediatric ICU nurse and mother of two I seem to never find the time to finish up my own sewing projects. My time at the sewing machine has been taken up by mending and altering clothes for my husband and kids. Im hoping to win this planner so that I could make a conscious effort to have more me sewing time. I have so many unfinished projects mama sewing time will be at the top of the list with this planner and it would be so exciting to win something just for me especially if it has to do with sewing, that would rock. What a wonderful way to keep organized of current and future projects!!!!! A wonderful tool to keep projects on track! This planner looks awesome. I would love to win one. I think this planner would kick start me into action! A planner is such a wonderful idea! I have a book that I keep pics of completed projects in…but an actual planner would be so inspiring! I currently keep a list of the various quilts that I would like to make or complete during the year, however, progress on the list is slow. I think if I were to use a planner to prompt me through each month it would be more of a challenge to see what can be completed each month. I do keep lists for other things and a quilter’s planner would be of great use. Thanks for holding the give away. I’m a beginner quilter. This will help me keep track of the quilts that I am making and plan to make. I have so much material purchased. I opened a bag the other day and was like, “ok, what was my plan for this?” I can keep notes in this planner on what I was planning to do with my stash. The planner looks amazing. Wow what a great prize I hope I win it. I’ve been eyeing this planner. Would love to have one! Never thought of using a planner; however, it just might be the best tool to keep me more organized and productive than I’ve ever been. I could sure use the help to be better organized! I need all the help I can get with staying organized. Practical, pretty AND inspiring!! This would help me get lots more accomplished. Enjoy your day! This sounds wonderful to have all my quilting projects in one place! I need help organizing my time. Definitely could use the planner. It looks amazing! I have been eyeing this and I need all the help I can get with getting and staying organized. Definitely looks like a great tool! What a great gift for a quilter! Thank you for having such a great blog… your energy positive energy come through the page! Love to win -planning might be the first step to doing! This would be a great system that I sorely need I get inspired at Missouri Star quilt, watch the videos, get the fabric, and then forget which pattern and fabric go together. I would love to have a way to keep it organized, like I used to do lesson plans for my classroom. Excellent idea. Creative planning gets it doen!! Looking forward to what you have to offer. Looks interesting. I’m terrible for trying to keep everything in my head AND being easily distracted so this would be a lifesaver for me! Hi! 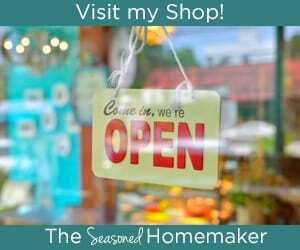 I’m a new subscriber to your blog….and I’m loving it! I’m also a brand new longarmer with lots of quilt tops waiting to get quilted from friends and family. I would love to win the Quilters Planner because I feel it would help me focus on my quilting goals this year, and help keep me organized. Bless you, and thank you for this opportunity. Thanks for the chance to win. I have so many projects, some started, some not, mostly gifts and I would love to stay in track better and not be pressed for time at the holidays. Well I’m thinking if my list of projects is in a planner it will prevent my daughter from noticing her name on a small chalkboard in my sewing room with a list of people and her realizing she is second from last! Haha. I get very distracted when sewing…I must keep too many projects going. I would love to use this to keep me focused AND work on my UFO’S. I am so new to sewing and am really enjoying it. My husband comes home and looks at me as I guiltily explain time got away from me and no, supper isn’t ready. How do I juggle all I have to do and all I want to do. This planner looks like the perfect answer! I really need help to keep track of my project and my imagined projects. I’m hoping it will help me shorten my list of quilts to make, and help me keep on task! This planner would get me on a schedule so I could actually get some projects started and completed!! I have so many quilt ideas constantly flowing through my mind that sometimes I get so frustrated I can’t even start. This planner will certainly simplify and organize all the quilts I would love to finish or start. I want to organize my projects to meet some important show deadlines this year. I have so much material that I have bought for specific projects over the years and now cannot remember what the projects are. I love the idea of being more organized in my fabric and quilting plans. This planner looks like a wonderful tool to accomplish that! This looks like a really well. planned out tool. Maybe it is time for me to get more organized…this is certainly a step in the right direction! Ha ha! You all know exactly why I need one, and why it’s highly improbable I’ll win one, but gotta be in it to win it! This planner looks like a great tool. I always depended on my planner at work, now that I’m not working outside the home, I would still like to plan my days. What a wonderful idea! Everything right at hand pertaining to each quilt being made! I sew but don’t really quilt, so this planner will really help me start right. Was a winner named yet?